Home Reliable Have You Been Strong for too Long? Have You Been Strong for too Long? There is absolutely nothing wrong with falling apart now and again. What other way does your Soul have than to be able to release unwanted feelings with buckets of tears and a snotty nose! There are lots of people who frown on the ones that have no problems showing and expressing their sadness, upset or hurt, those that frown might see it as a sign of weakness. We are built to be tough, growing up we heard the term ‘it’s a cruel world out there’, more times than we heard the opposite. Fathers encouraged their daughters to be a little bit like men, maybe they still do, in any case ‘they’ are right, it is a tough and often cruel world, which gives us even more reason for the need to cry. It is better to spill out the overflow of emotion, than keep it bottled up inside. Harbouring our sentimental and natural instinctive state of mind, especially when the mood is sadness, anger or anything that touches our Soul enough to warrant the need to cry, is not the best or healthiest way to react. We as intuitive sensitive humans are made out of the stuff to that which creates a need for emotional response, every inch of us is built on a foundation of sentimental sensitivity. Being able to express wholeheartedly at any given time, how you are feeling is a golden gift, not a curse. A heart that is compassionate, thoughtful and tender gives to this Earth what it very much needs, pure and gentle energy. If it wasn’t for the sensitive ones, this world would be crueler than it already is. 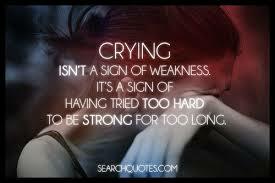 So every time you feel the need to cry, let your tears bring not only healing energy to you but to the world as well. For every one of your tears that drops to the earth, plants a kindhearted, sympathetic little seed of healing energy, there is no sweeter gift to give than that. Don’t hold back what you instinctively were built to do, don’t smother your emotions and stuff them away, don’t allow anyone to convince you that crying is weak, it certainly is not. Treasure your sensitivities and embrace this part of you, it is something you were born with and it is definitely a very beautiful gift and no curse at all.